Check out all the Krazy Deals we found for June 2018. Did you know that June is the third month of the year with less than 31 days? Although June may be one of the shorter months of the year, its supply of shopping events and promotions is far from lacking. It is said that June is the perfect time to stock up on undergarments. This in part is thanks to Victoria’s Secret who is known to host one of its famed Semi-Annual Sales in June. Be on the lookout for other retailers who are sure to offer equally competitive sales in their undergarments department. You may also consider buying a gym membership during the summer, this may be because the hype of the New Year’s resolutions are dwindling and people who signed up as part of their resolutions have since canceled their memberships... Or gyms realize it’s starting to get a little hot out there, here in the Northern Hemisphere. This may deter some from being active outside and they are looking for cooler places to get their workouts in. Regardless of why, the fact remains, Gyms seem to be more eager for sign-ups at this time. So look for those offering deals and discounts on their memberships. Did you know in the United States, Flag Day is June 14th? Flag Day honors and commemorates the adoption of the flag of the United States which occurred on June 14th, 1777. Some states provide a sales tax exemption for flag purchases on Flag Day. Also, retailers in the past have been known to offer Flag Day deals and even Flag Day sidewalk sales. So be on the lookout for those on Thursday, June 14th, 2018. Father’s Day is Sunday, June 17th, 2018. Father’s Day commemorates fatherhood and gives us all a chance to celebrate and appreciate all fathers and father-figures including grandfathers, great-grandfathers, stepfathers, foster fathers…etc. Like Mother’s Day retailers offer an abundance of deals and specialty gifts just for dad! Lastly, we have the first day of summer known as the Summer Solstice on Thursday, June 21st, 2018! You know what that means? Summer Sales GALORE!! Please be sure to pay attention to the Good Through Dates that have been included with each deal posted. If no Good Through Date is included that means this is an ongoing promotion with no end date listed. Some of these dates and deals aren’t here yet and are coming up this month or depending on when you’re reading this, those dates may have already passed… So, here are just some of the Krazy Deals we have found for June 2018. Let the deal hunting begin!! 3. Save 10.0% on select products from DieHard with promo code10DHBATTERY, Offer Good Through 6/19/2018 while supplies last. 4. Save $250.00 on select products from American Spas with promo code 250AMSPA18, Offer Good Through 6/30/2018 while supplies last. 5. Save 15.0% on select products from Hirts: Cacti & Succulents with promo code 15SAVENOW, Offer Good Through 6/27/2018 while supplies last. 2. Extra 20% off during the Time to Shop Hundreds of Specials with code SHOP. Shop now at Macys.com! Offer Good 5/30/2018 Through 6/4/2018. 3. 25% off Macy's Father's Day Sale with code DAD. Shop now at Macys.com! Offer Good 6/14/2018 Through 6/17/2018. 4. HOME ONLINE ONLY 2 DAY BEAT THE HEAT EVENT! SAVE 30-50% OFF REG PRICED ESSENTIALS. PROMO CODE: HEAT Offer Good 6/26/2018 Through 6/28/2018. 5. 20% off Macy's Fourth of July Sale with code FOURTH, plus Free Shipping at $49. Shop now at Macys.com! Offer Good 6/28/2018 Through 7/8/2018. 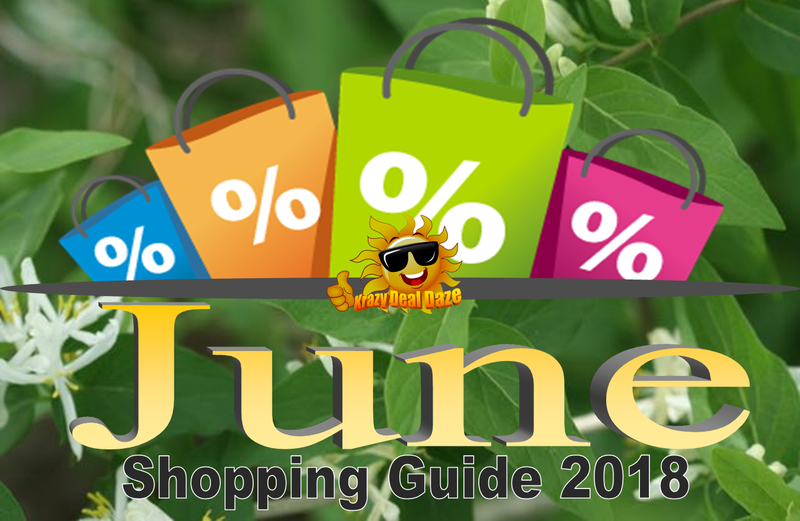 Thank you for stopping by and checking out our June Shopping Guide! Which Krazy deal are you most excited about this month? Be sure to let us know in the comments below! Wow! So many awesome summer deals at all the retailers. You are like a sale genie! I wish my gym did offers over the summer - I heard they're putting the price up for new members. Looking forward to the summer sales I need lots of summery items. I am not a big shopper but it is still good to know some special deals at these retailers this month. I do go to Sally's beauty supply from time to time. So many awesome deals to watch out for this month. Good tip on the gym memberships. It's really nice to be able to stock up on under garments without spending too much. Love all the deals this month! This is a really great post. So jam packed with information and deals to watch for. I am really liking the tip about getting a gym membership in the summer! Shopping is my favourite thing to do and I am interested in many of the deals here. Will check them out. That's why June is already flying by! So many great discounts, will have a look! Thank you so much for this extensive list of deals! This is so fantastic! Great gifts and great deals! What dad wouldn't appreciate that? A very handy post, I'm going to go trough all those links to see if I can't find me a bargain! I didn't know about the Ann summers sale! So many great deals and sales to shop this month! Thanks for providing so much awesome info... can't wait to shop!